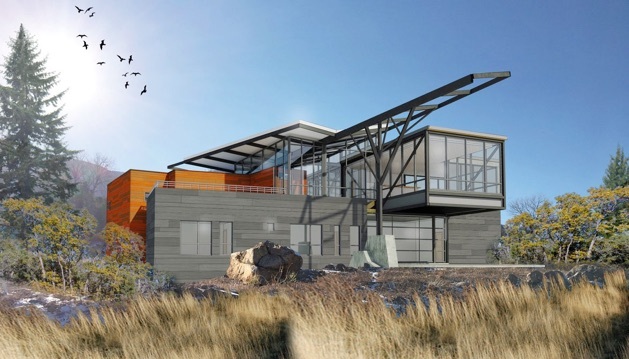 The Canopy House is to be perched in the foothills of Colorado Springs, and because of its unique design, offers panoramic views of both the Cheyenne Mountain range and the downtown region. The house will have a three-car garage, 4 bedrooms and 3-1/2 baths, with upper and lower levels carefully nestled into the sloping site. Though it has a large expanses of glass to create a visual relationship between indoor and outdoor, much of the glass area is shaded by the canopy and other building masses as an energy conservation measure. A fully-glazed and dramatically cantilevered main-level kitchen, dining, and living room spaces afford expansive views of Downtown, contrasted by more private and subtle view of Cheyenne Mountain from the master bedroom suite and the guest room/office. The lower level contains two bedrooms and a shared jack-and-jill bath coupled with a family and entertainment room that opens onto private patio area. The house’s namesake, the prominent canopy that spans the main house, is not only designed to shade the glass, but also cleverly hides a photovoltaic system (solar panels) that works to reduce its energy footprint and lower monthly utility bills. The building is also partially covered with phenolic panels, themselves a high-tech ‘rain-screen’ that not only provides a maintenance-free and fire-resistant barrier, but also acts as a heat-sink in dissipating heat gain. The building uses innovations that have become keynotes of a ‘markharris ARCHITECTS’ design, specifically those of ‘Component Design Strategies’ which borrows proven processes from industrial and automotive industries to provide a highly-performative, highly-sustainable, and highly-engaging work of architecture. Many parts of the house, such as the dramatic steel and glass bridge that composes the main house, are produced under the precise conditions of a steel shop rather than loosely constructed on site.